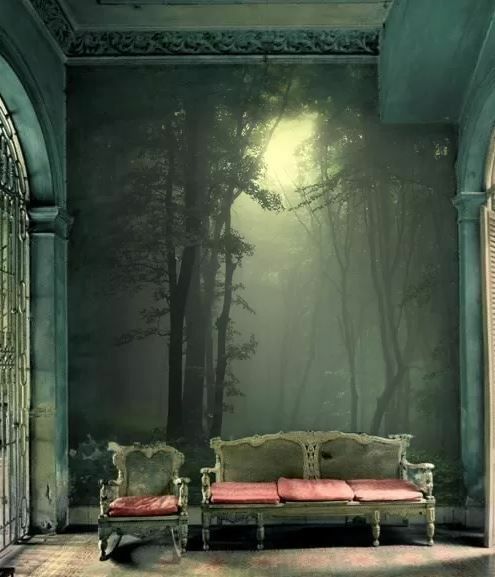 The website photos have large, obtrusive water marks so I could only find a couple from other sources, but Pixers’s “forest after rain” murals are some of the most beautifully atmospheric wall decorations I’ve ever seen. Although the weather does affect my mood, I’m partial to the foggy, cloudy murals on the site because the hazy glow is much more dreamlike. The crisp light of the sun shows everything in sharp detail, but in the obscured distances beyond the fog…all possibilities exist at all time. This entry was posted on August 24, 2015 at 5:52 pm and is filed under decoration, home, nature, wish list with tags decoration, home, nature, wish list. You can follow any responses to this entry through the RSS 2.0 feed. You can leave a response, or trackback from your own site. Wow! 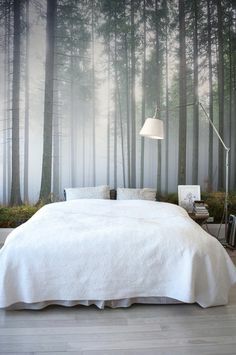 Took me a bit to realise what was going on here but man, having a whole forest in your bedroom sounds good to me! Indeed. They’re expensive, but…one day. Imagine decking the house out in these with an autumn image!